Scheduled Tasks let you configure certain tasks for automatic performance and recurrence at specific intervals. Tasks can include generating pick lists, importing/exporting products, importing/exporting orders, exporting a predictive purchasing file, etc. These are all documented below. First, check out this short tutorial! Follow these initial steps to create the scheduled task, but go to the specific procedure in this topic to configure your task type. Click Settings > Toolbox > Scheduled Tasks. The New Task Type drop-down menu shows all tasks available for scheduling. Choose a task > Go. On any task, check the Schedule Enabled box. Enter a start time. The start time includes a calendar date and time. Both values can be selected from the Calendar and Time View pop-ups. To end the task on a specific date, pick an Expire Schedule date. If desired, add notes about the scheduled task in the Queued Job Note field. For example, flag a picklist type. Notes are viewable on the queued job. Email alerts can be sent to a specified address or addresses upon completion of the task. SMTP settings will need configuring within the task to determine the email address from which to send the notification email. Additionally, you can select an email template to determine what text appears in the body of the notification email. Click the specific procedure below to configure the desired type of scheduled task. Although tasks run on schedule, you can run a task manually: On the main Scheduled Task page, choose the task > open the Action menu and choose Execute Task > Go. Select a User ID. This will allow a search for picklists by user. This next step is critical: Picklists are generated for specific orders, such as current orders that have not shipped. Scheduling a picklist for those orders is accomplished by linking a Saved Search to this picklist generation. After you have your saved search for unshipped orders, you can choose that search from the Saved Searches dropdown, and a picklist will be generated only for those orders. To view and manage your scheduled tasks, open the Scheduled Tasks page with a grid of all your tasks. Access the task by clicking the task name. Delete the task or execute it now by checking the task and selecting those actions from the Action Menu. Email alerts can be sent to specified addresses upon completion of all tasks. Choose the correct Product Processor Plugin/Profile from the dropdown menu. Typically, inventory files are imported from an FTP folder. In the Import From field, choose FTP. FTP Directory - When there are multiple directories(folders) on the FTP, enter the correct directory. Typically, you must enter a / (forward slash) before the directory name. See the Note below. FTP FileName - When there are multiple files in specified directory, enter the file name. Typically, you do not need a / (forward slash) before the directory name. See the Note below. If you want the task to load multiple files into one folder, enter a * (asterisk) in the file name. This will grab all the files in that directory. Alternatively, you can archive the file after processing by choosing Archive files instead of Delete. Set up a sub-directory within the specified directory for archiving. When this option is enabled, the file will be removed and placed it in the sub-directory. Enable Use Passive if the connection cannot be made due to firewalls on your server. Select the company to which orders will be associated. Select the correct order processor plugin from the dropdown. Typically, order files are imported from an FTP folder. Enter the FTP credentials. FTP Directory - When there are multiple directories(folders) on the FTP, enter the correct directory. Typically, you do not need to enter a / (forward slash) before the directory name. See the Note below. FTP FileName - When there are multiple files in specified directory, enter the file name. Typically, you do not need to enter a / (forward slash) before the directory name. See the Note below. You can select to delete the file from the FTP. This is always recommended, but is necessary if the file dropped onto the directory is always renamed, or if the file is not set to overwrite an existing file. Alternatively, you can archive the file after processing. Set up a sub-directory within the specified directory for archiving. When this option is enabled, the file will be removed and placed it in the sub-directory. Enable Passive Mode if the connection cannot be made due to firewalls on your server. "Export Products" works by linking the export to a saved search. Only products in the Saved Search will be included in the export. Log into a user under which the search will be stored. Saved searches are per user, so you will only be able to view and edit the search assigned to the task under a single user. Choose your desired filters and search orders, then save the search. From the New Task Type dropdown, select Export Products > Go. Set up a name for the tasks, start time, and run frequency. Select the correct user and Saved Search. Select the correct export plugin from the Export Via Plugin down. Alternatively, you can select from an export mapping tool profile. Enter the filename of the inventory file you are exporting. Entering the placeholder #?QueuedJobID?# populates the filename with the queued job ID. Entering yyyyMMdd populates the filename with the date of file creation. Sample filename: PHI_ONHAND_yyyyMMdd. Entering MMddyyyyHHmmss (where HH = hours, mm = minutes, and ss = seconds) populates the filename with the current date and time). Sample filename: PHI_ONHAND_MMddyyyyHHmmss. Choose to export to FTP or Email. If exporting to FTP, enter FTP credentials. See bottom of page if exporting to a VAN. If there are multiple folder/directories, enter the remote folder into which the file will be exported, with a forward slash / before the folder name. If exporting to email, enter the SMTP credentials or click Copy From Company Settings if those will be used. "Export Orders" works by linking the export to a saved search. Only orders in the saved search are included in the export. From the New Task Type dropdown, select Export Orders > Go, and include a task name, start time, and frequency. Select the correct User ID and Saved Search. Select the correct export plugin from the Export Via Plugin menu. Alternatively, select from an export mapping tool profile. Entering the placeholder #?QueuedJobID?# will populate the filename with the queued job ID. Entering yyyyMMdd will populate the filename with the date of file creation. Example filename: PHI_ONHAND_yyyyMMdd. Entering MMddyyyyHHmmss (where HH = hours, mm = minutes, and ss = seconds) will populate the filename with the current date and time). Example filename: PHI_ONHAND_MMddyyyyHHmmss. If exporting to FTP, enter FTP credentials. If exporting to a VAN, read this. If exporting to email, enter the SMTP credentials or click Copy From Company Settings if those settings will be used. There is no file on FTP matching criteria to process - Add the forward slash before the directory name and retry. File name _____________________ doesn't match file name __________________ - Add the forward slash before the file name and retry. Can't log in - Check that the FTP credentials are correct. From the New Task Type dropdown, select Reports > Go. Set your start time, recurrence, and related fields. Select your desired Report Type. Certain report types have a Summarize By dropdown to sort data by channel, vendor, customer, etc. Set the Date Range. Set the current date of the task execution as the end date. Notifications can be sent to email or FTP. Choose those settings in the Export To field. This task will take unreceived items/units from purchase orders and generate an Excel file with those items and quantities. It will only pick POs that are in Saved, Ordered, or Pending statuses. POs will automatically be emailed to the vendor for clarification. From the New Task Type dropdown, select Open Purchase Orders Reminder > Go. Choose a Vendor. The task is vendor-specific, so needs a separate task for each vendor. Enter an Older than Days value. The task will only look at POs older than this value. Create a template for Open PO Reminders and set it to the Purchase Order Reminder template assignment. Read more here. The generated Excel file will be attached to the email and sent to the email address on the vendor profile. From the New Task Type dropdown, select Amazon Reports > Go. Inventory Health Report - This contains detailed information about your FBA inventory. Note: This report type requires selecting Enable Inventory Health Report in your company's Amazon settings. Set the Export To field: Send by email or pushed to your FTP. You can create a scheduled task that automatically exports a predictive purchasing Excel file to email or FTP. This task will auto-generate a PO by default, but you have the option to turn that off by selecting the Do not create PO box. From the New Task Type dropdown, select Predictive Purchase Order > Go. 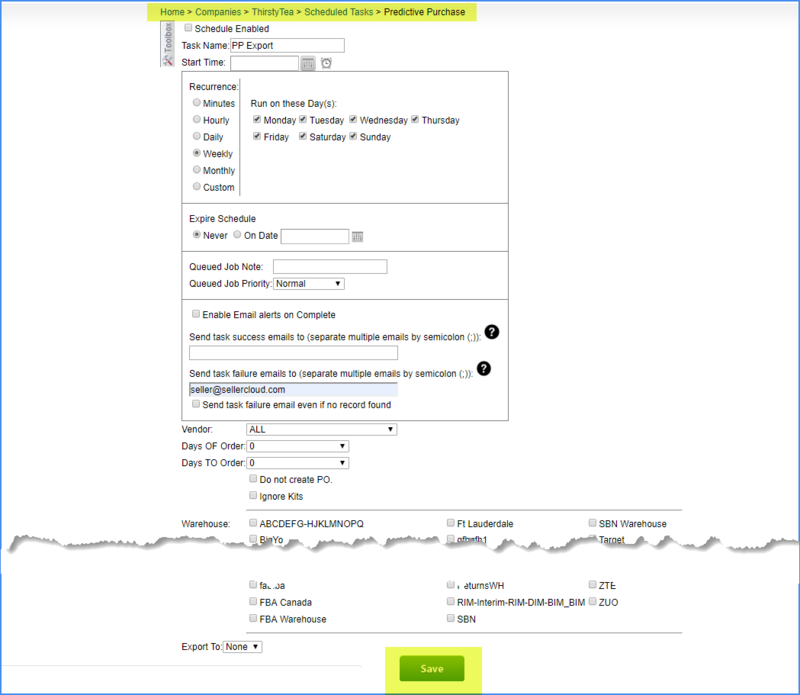 Configure the task based on the information in this Predictive Purchasing topic > Save. For example, Days To Order; Days Of Order; specific vendor filters, etc. To have this automatically sent to you, set the Export To field to an Email account or FTP where the output file should be placed. When done configuring, click the Schedule Enabled box at the top, and click Save at the bottom.